It’s easy to remember The Twilight Zone as a show defined by its prophetic social messages. Suburban witch hunts scripted in the shadow of McCarthyism, a future in which plastic surgery makes everyone look the same, a naïve human trust of otherworldly beings who plan to cook you for dinner—these stories are still perfect. Even with the limitations of 1960s special effects, The Twilight Zone’s best horror is timeless and often the scariest thing you’ll confront in its murky universe is the fallibility of humanity. Of course, The Twilight Zone was also often bad. For every episode that mines the worst of humanity for philosophical television gold, there’s another that’s entirely forgettable or bogged down by a cheesy premise. Who hasn’t fallen asleep during episodes like “From Agnes — With Love,” a dull story about an evil robot, or “Back There,” in which a man goes back in time to try and save Abraham Lincoln? Who even knows which episodes these are? There’s a lot to improve in the latest Twilight Zone reboot, premiering April 1 on CBS All Access, which develops relatively new stories inspired by past episodes. And it walks in the footsteps of its original, in that a few of its episodes fail to fulfill the best aspects of a great, timeless Twilight Zone episode. Instead, the tone is often whimsical, frequently reveling in its retro roots rather than transporting the Twilight Zone into a darker aesthetic. Produced and hosted by Jordan Peele in the Rod Serling role, the new Twilight Zone reboot is often cartoonish. Given Peele’s horror film bonafides, and that the show’s greatest competitor right now might be Black Mirror—a true Twilight Zone for these times—you’d think CBS’s take might attempt to actually revamp the show as something slicker and more overtly terrifying. Instead, the tone is often whimsical, frequently reveling in its retro roots rather than transporting The Twilight Zone into a darker aesthetic. The episodes are awash in the desaturated neon glow of classic diners and smokey comedy clubs, each one a paranoid mini-noir. The racially diverse, big-name cast is also a major correction in not just the original Twilight Zone (which starred, unsurprisingly, pretty much exclusively white people) but in sci-fi in general, which still manages to create new worlds that barely retain the diversity of the one we have now. While this new Twilight Zone might feel PG-13 in the horror department, the moral lessons of each (or sometimes a lack thereof) differ significantly between episodes. In “The Comedian,” Kumail Nanjiani plays a failing comedian who mines his personal life for material, because it’s the only thing that makes audiences laugh and brings him internet fame. He does it for a price: any person he turns into a punchline is erased from his life. It’s a simple, magical premise with a loud message at the center (don’t degrade loved ones in exchange for Twitter followers, you goons!) that might veer into corniness, but viewers might miss its simplicity as the series goes on. In other episodes, the writers and directors seem to confuse successfully modernizing The Twilight Zone with simply complicating it. The second episode is teasingly titled “Nightmare at 30,000 Feet,” but it includes no monsters on the wing. Instead, it features Adam Scott as an investigative journalist who inexplicably finds an .mp3 player uploaded with a mystery podcast, which tells him information that could hurt the flight. I’ll repeat: the second episode of the new Twilight Zone features a man being terrorized by a bad podcast, and it ends with such a rushed set of twists that you’ll be begging to have opted for a rubber-faced creature on the wing. Similarly, an episode starring Steven Yeun as a mysterious traveler (he claims he’s a YouTuber who loves to travel to weird places, which might honestly be believable in 2019) hanging out in a remote Alaskan jail is built with great, creepy suspense by director Ana Lily Amirpour, but ends in an overly complicated political whodunnit. It’s an episode featuring a VHS camcorder that actually happens to be the most modern and the most disturbing. “Replay” borrows from the 2003 reboot’s episode, “Rewind,” which features a camcorder that can rewind time. 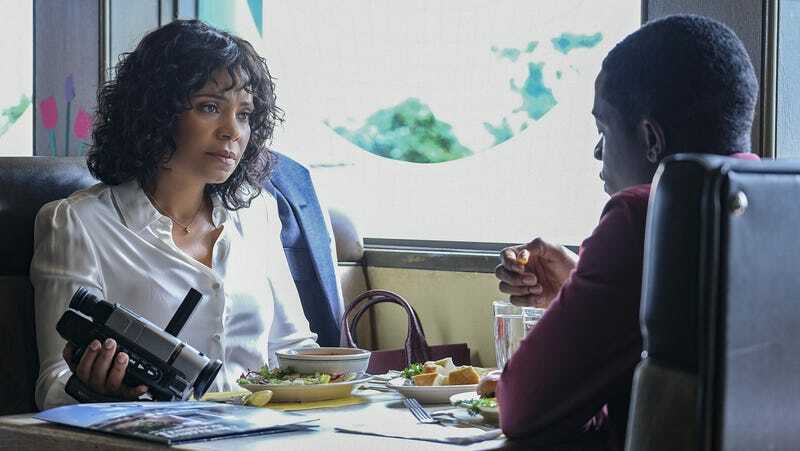 In “Replay,” Sanaa Lathan plays a mother taking her son to college in the South, but they are continually stopped by a white police officer with an agenda. Rewind after rewind, she tries to shake the officer off her back and the Gerard McMurray-directed episode, a stressful loop-de-loop, dissects the stress of a black family always recording every interaction with a cop. Classic Twilight Zone is at its best when it’s speaking to greater issues like “Replay,” but also when it keeps it simple, throwing one life-changing, otherworldly abnormality in what should be an average day. The reboot doesn’t need to copy the original’s footsteps, but is the scariest thing that can happen to someone on a plane really discovering a podcast that predicts their life? The answer is no, of course. The reboot might possess Serling’s playful, finger-wagging heart, but it doesn’t possess its minimalism. Just like the many characters that get thrown into the Twilight Zone’s orbit, viewers of the reboot will get much more than they bargained for.